Indeed, some 3,000 lobbyists had swarmed the Capitol in hopes of killing off pieces of the proposed bill—nearly six lobbyists for every member of Congress. For Michael Barr, then an assistant secretary at the Treasury Department, the trench warfare spurred by Dodd-Frank left him shellshocked. “You pick a page at random,” says Barr, now a law professor at the University of Michigan, “and I’ll tell you about all the issues on that page where the fighting was intense.” Remarkably, despite the onslaught, Dodd-Frank “got stronger rather than weaker the closer we got to passage, which is incredibly unusual,” says Lisa Donner, executive director of Americans for Financial Reform, one of a handful of advocacy groups that fought tenaciously for the bill. That sense of victory barely lasted the morning. The same financial behemoths that had fought so ferociously to block Dodd-Frank were not going to let the mere fact of the bill’s passage ruin their plans. “Halftime,” shrugged Scott Talbott, chief lobbyist for the Financial Services Roundtable, a lobbying group representing 100 of the country’s largest financial institutions. It was 5:30 am on a Friday when a joint House-Senate conference committee approved the bill’s final language. By Sunday, an industry lawyer named Annette Nazareth—a former top official at the Securities and Exchange Commission whose firm counts JPMorgan Chase and Goldman Sachs among its clients—had already sent off a heavily annotated copy of the 848-page bill to colleagues at her old agency. According to a congressional staffer whose boss was a key architect of Dodd-Frank, Nazareth is one of two “generals” running the campaign to undo the bill. The other is Eugene Scalia, a fearsome litigator and son of the Supreme Court justice. 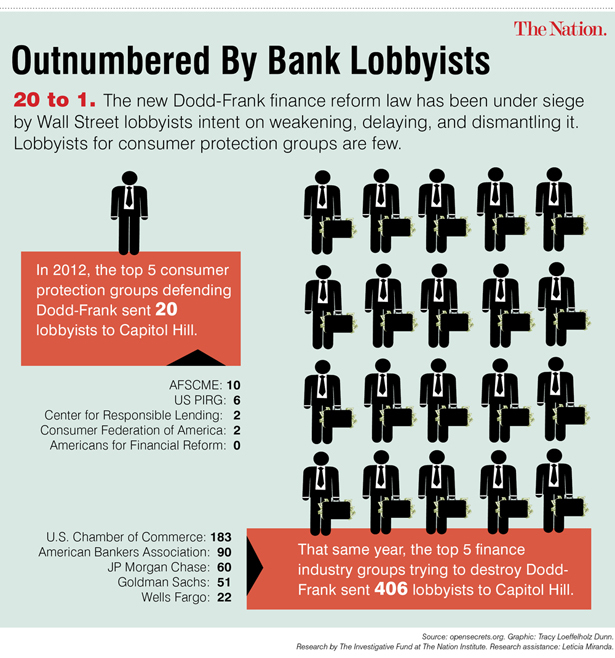 After Dodd-Frank’s passage, lobbyists for the big banks and industry trade groups divided themselves into eighteen working groups, each organized around a different element of the new law. “That’s when the real work began,” Talbott tells me. One working group focused on derivatives reform, including the requirement that these complex financial instruments now be sold on open exchanges in the fashion of stocks and bonds. Another focused on efforts to hammer out the so-called Volcker Rule, which would limit the ability of federally insured banks to wager on risky ventures. A third tackled the new Consumer Financial Protection Bureau (CFPB), created to protect ordinary consumers from Wall Street deceptions involving mortgages, credit cards and other major profit centers for the banks. In the months leading up to Dodd-Frank’s passage, the big story was the staggering sums of money being spent by the industry to defeat the bill—more than $1 billion on lobbying alone, according to one estimate. Yet, incredibly, the financial sector dramatically increased its spending after Dodd-Frank was signed. 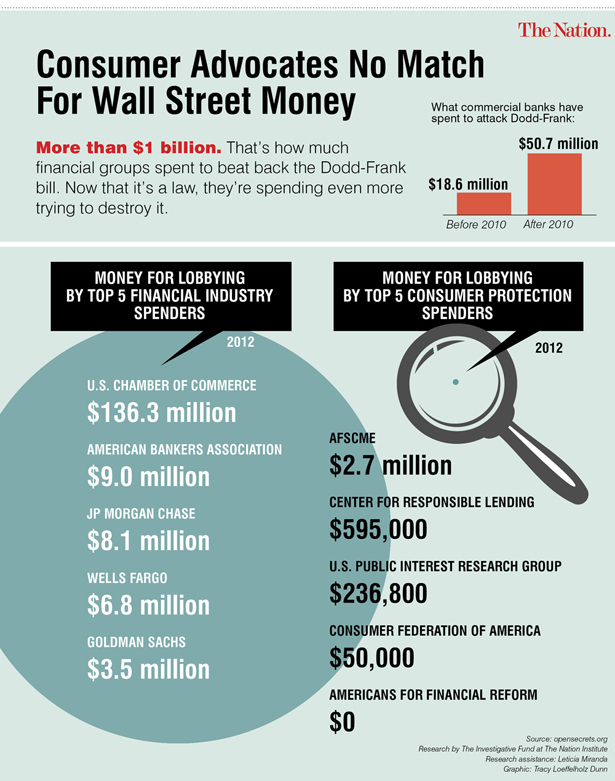 Whereas commercial banks such as Wells Fargo, Citigroup and JPMorgan Chase, along with their trade groups, spent $55 million lobbying in 2010 (the year Dodd-Frank became law), they would collectively spend $61 million in 2011 and again in 2012, according to OpenSecrets.org. The twenty-eight lobbyists Talbott has on the payroll at the Financial Services Roundtable makes it relative small fry. The American Bankers Association has ninety-one lobbyists representing its interests, while the US Chamber of Commerce has 183. Goldman Sachs has fifty-one lobbyists, JPMorgan Chase sixty, and even the obscure-sounding Securities Industry and Financial Markets Association is armed to the teeth, hiring the services of forty-nine lobbyists. Dodd-Frank’s Achilles’ heel is that it leaves the tough work of writing the actual regulations to existing federal agencies like the Federal Reserve and the Securities and Exchange Commission, which had failed so miserably at protecting the public interest in the run-up to the 2008 crash, as well as to backwater independent agencies like the Commodity Futures Trading Commission (CFTC), which was tasked with regulating a derivatives market that played a central role in the collapse of the global economy. The story of how Wall Street lobbyists worked the halls of Congress, blocking the appointment of Elizabeth Warren, Obama’s first choice to head the CFPB, or pushing bills aimed at defanging Dodd-Frank, is fairly well-known by now. But it was the stealthy work of battalions of regulatory lawyers, who descended on the private offices of regulators deep inside the bureaucracy, that has proven more crucial to the industry’s effort to pick off pieces of Dodd-Frank. There, a kind of ground war has been going on for almost three years, with the regulators waging hand-to-hand combat to defend every clause and comma in Dodd-Frank, and the lawyers fighting to insert any loophole they can to protect their clients’ extraordinary profits. This is how the miracle that was the making of Dodd-Frank—hailed as the most comprehensive financial reform since the 1930s—became a slow-moving horror movie called “The Unmaking of Dodd-Frank”: a perfect case study of the ways an industry with nearly unlimited resources can avoid a set of tough-minded reforms it doesn’t like. Sadly, part of this story involves the reluctance of the left, and Democrats generally, to rally around a bill that failed to deliver everything reformers wanted. Lisa Donner can readily tell you everything that Dodd-Frank doesn’t do. She’s heard her share of grumbling as executive director of Americans for Financial Reform, a coalition of 250 consumer, labor and civil rights organizations that joined forces during the debate over the bill. Among the criticisms: it doesn’t reinstate Glass-Steagall, the Depression-era law—tossed in the 1990s—that walled off the banks in which ordinary people keep their savings from high-risk investment banking; no banker will stand trial because of the bill; nor has it provided compensation to a single family who lost their home in the subprime disaster. But if it’s possible to love a piece of legislation, Donner is smitten with Dodd-Frank. She sums up the CFPB as “astonishing” and deems the bill’s regulation of derivatives “very important”; likewise its requirement that a bank hold on to at least 5 percent of any portfolio it securitizes unless it’s made of the safest plain-vanilla mortgages—a policy that could have gone a long way toward preventing the worst of the subprime calamity. She lists several more meltdown-related provisions that would give regulators “potentially very powerful tools”—if they ever take effect. Plus there are many hidden gems for progressives buried in Dodd-Frank. There’s an anti-bribery clause requiring companies to disclose payments to a foreign government when they acquire drilling and mining rights, and another requiring US corporations using “conflict minerals” to ensure that they were not mined in the Democratic Republic of Congo, which is being ravaged by those warring over tin and tungsten. Another provision caps the fees a bank can charge for debit-card transactions. “There’s so much in there we could never have gotten on a single up-or-down vote,” Donner says. And yet, this landmark legislative achievement went virtually unmentioned on the 2012 campaign trail. If President Obama chose not to trumpet Dodd-Frank so as not to alienate deep-pocketed backers on Wall Street, the strategy didn’t really pay off: Mitt Romney’s top six donors were all financial institutions—including Goldman Sachs and JPMorgan Chase, which had been among Obama’s top ten donors in 2008 but fell off that list in 2012. Organized labor, meanwhile, perhaps distracted by its own frustrated legislative priorities, never mounted a full-court press in support of the legislation either. The law’s passionate defenders consist of maybe a few dozen advocates, totally overwhelmed by the lobbying and legal muscle on the other side. The mismatch was vividly on display one day last fall, when Richard Cordray, the CFPB’s director (at least until his recess appointment expires at the end of this year), testified before the Senate Banking Committee. The hearing room was thick with power-suited lobbyists, well-groomed and coiffed, each wearing shoes that probably cost more than the typical American worker takes home in a week. And then there was US PIRG’s Ed Mierzwinski, bearded and bespectacled, wearing tan khakis with a conspicuous stain on one leg. His off-the-rack blue sport coat was paired with a too-wide tie slightly askew at his neck. Earlier, over breakfast at the low-budget Capitol Hill cafeteria, Mierzwinski told me that as US PIRG’s point man on financial reform, he tries to attend every congressional hearing related to the issue, but he simply can’t make them all. Records maintained by OpenSecrets.org show that US PIRG and the Consumer Federation of America, two of the more prominent consumer advocacy groups on Capitol Hill, have spent a combined $1.1 million on lobbyists over the past three years—in contrast with the more than $350 million spent by the Chamber of Commerce during that same time period, or the $25 million laid out by the American Bankers Association. “How do you compete when one side is this hydra-headed monster that can devote unlimited resources to killing, gutting or otherwise weakening financial reform?” asks Dennis Kelleher, himself a former corporate lawyer who now runs Better Markets, a small nonprofit pushing for stronger financial regulations. And how can you compete, asks Bart Chilton, a former Agriculture Department official under Bill Clinton who is now a CFTC commissioner, with the “full-meal quadrakill deal”? Chilton laid out the industry’s four-pronged offensive strategy last year at a conference of consumer advocates. Phase one is the legislative effort to kill the bill before it has a chance to pass. Phase two consists of pushing Congress to defund regulatory agencies like his. The third and fourth phases, said Chilton (who has a speaking style that calls to mind no one so much as Ross Perot), is reserved for players like the financial industry—“the class of folks who have some buckaroos.” Phase three began immediately after passage of Dodd-Frank, when those squadrons of regulatory lawyers descended on people like Chilton. And if a regulator ever succeeds in publishing a rule, Chilton says, then brace yourself for phase four, or what he calls ”Defcon 4”: the bankers take the regulator to court, hiring the likes of Eugene Scalia, who has carved out a lucrative niche blocking such rules on technicalities. Kelleher calls them “sore-loser suits,” but there is no denying their effectiveness: one of Scalia’s lawsuits can bollix up a rule indefinitely, if not get it thrown out entirely. Scalia had already filed six Dodd-Frank-related suits against the government by the end of 2012—and he only smiled when I asked him if he had plans to file more. In April, he filed a seventh. Perhaps no part of Dodd-Frank matters more than the CFTC’s battle to implement derivatives reform. Certainly the big banks wouldn’t argue that point: no product peddled by Wall Street has proved as lucrative in recent years, especially for the country’s most elite firms. Just five banks—Goldman Sachs, JPMorgan Chase, Citigroup, Morgan Stanley and Bank of America—account for more than a 95 percent share of a derivatives market that has been generating an estimated $40 billion to $50 billion in annual revenues. Because derivatives have been traded on dark (i.e., unregulated) markets, this “oligarchy” of five, says Darrell Duffie, a finance professor at Stanford’s Graduate School of Business and the author of How Big Banks Fail and What to Do About It, has been able to charge exorbitant rates to the wide range of businesses and government entities that buy them—profit margins that are sure to plummet if Dodd-Frank is fully implemented, Duffie says. That alone would justify the huge sums spent on lobbying to gut Dodd-Frank, a reflection of the banks’ unflinching resolve to protect the billions of dollars in derivatives profits they book every year. “If you look at the energy and ferocity and the dollars the financial sector put on the table, it was overwhelmingly directed at derivatives,” says Michael Barr, the former Treasury official. This is why derivatives—and by extension, the CFTC—should matter to the rest of us as well, at least if we want to reduce the odds that the banks will again blow up the global economy anytime soon. It was derivatives, after all—all those credit default swaps, collateralized debt obligations and other exotic financial instruments that most of us would learn about in newspaper infographics offered only after the fact—that were the main culprit in the collapse of insurance giant AIG. They were also the main problem in the failures of Lehman Brothers and Bear Stearns, and nearly took down the other big banks as well. Price manipulations of basic commodities such as oil and grains through derivatives are another target of Dodd-Frank, which instructs the CTFC to create “position limits”—caps on the portion of a market that financial speculators can own. The need for this check on financial speculators has never been clearer than in recent years, given the wild fluctuations in the price of oil in 2008, when a barrel of crude rose to $145 before whipsawing back to $37 in early 2009, and a spike in the price of wheat and other basic grains that caused rioting around the world. The push to regulate a new breed of ever more complex derivatives goes back to the 1990s. The catalyst was the central role these instruments played in the financial collapse of Orange County, California, which in 1994 became the largest municipal entity ever to declare bankruptcy. Those in favor of derivatives reform would find their champion in Brooksley Born, who headed the CFTC under Bill Clinton. Think of most derivatives as a bet on the price of something going up or down—an interest rate, say, or mortgage defaults. Her agency was already in the business of regulating the futures markets for commodities such as corn and soybeans, Born argued, so why not add this new breed of financial derivatives to the CFTC’s portfolio? But this was in the Clinton era, when Democrats worked overtime to win the affections of Wall Street, and Wall Street knew that transparency would only spoil a good thing. Clinton’s top economic advisers, including Treasury Secretary Robert Rubin and Lawrence Summers, the deputy who would take his place in 1999, overruled Born and worked with Congress to pass what became the Commodity Futures Modernization Act of 2000, which had the effect of deregulating much of the derivatives market along with basic commodities like oil. Just eight years later, the world economy was in tatters, in no small part because of that decision. Those championing derivatives reform were disappointed when President-elect Obama named Gary Gensler to head the CFTC in December 2008. Gensler was, after all, a Wall Street insider who had spent eighteen years at Goldman Sachs. Worse, he had served as assistant treasury secretary when the disastrous decision on deregulating derivatives was made. Given his years at Goldman, a central player in that market, Gensler was recused from participating in the debate during his first year in office, back when the Treasury Department was working overtime to stop Brooksley Born in her tracks. But he readily admits that he fought hard in favor of the Commodity Futures Modernization Act. His reasoning: the banks were already answerable to regulators, so why rope in another agency to monitor this one category of product? Yet after watching what transpired, Gensler had a change of heart—and as Dodd-Frank was cobbled together in committee, Gensler fought his old colleagues at every turn. He proved willing to take on his fellow Democrats if it meant giving the CFTC more teeth to pursue reform, even causing a kerfuffle inside the White House when he sent a letter to Barney Frank and other committee chairs, calling on them to go further than the administration’s proposals in overseeing the derivatives market. “He’s shown that he’s no industry lapdog,” says Barbara Roper, the director of investor protection at the Consumer Federation of America. But that, of course, was only halftime. 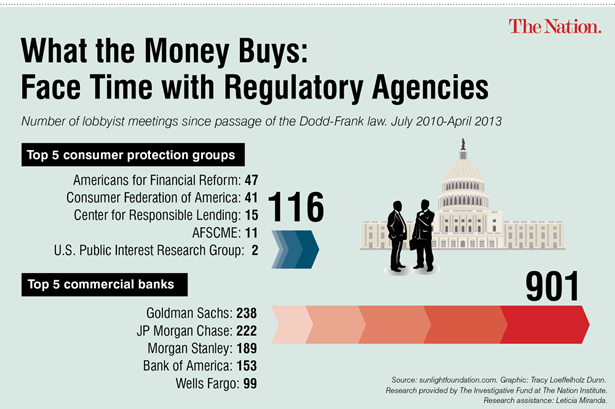 Gary Gensler provides an interesting window onto the fight over Dodd-Frank’s implementation. These days, no one seems to doubt his commitment to seeing through what he started; the only question seems to be why his outlook changed so dramatically. Gensler shrugs when I ask what prompted his reversal. “We all evolve,” he says, readily acknowledging that he and his colleagues in Treasury made a terrible mistake back in 2000. He is also a man under siege. That much was obvious in the guided tour he gave me of what I came to see as a kind of Hall of Shame—a corridor near his office lined with framed photos of his predecessors. None still work at the CFTC, Gensler said, but it’s amazing how often he sees many of them. He nodded his chin toward a photo of Michael Dunn, his immediate predecessor as CFTC chair: Dunn now works for Patton Boggs, a lobbying giant whose clients include Goldman Sachs and Citigroup, two of the largest derivatives profiteers. The man in the next photo is Walter Lukken, acting chair of the CFTC for the final eighteen months of George W. Bush’s presidency. Lukken is “around all the time,” Gensler said, as president and CEO for the Futures Industry Association, which describes itself as “the only association representative of all organizations that have an interest in the listed derivatives markets.” Bush’s first CFTC chair, James Newsome, is co-founder of Delta Strategy, a lobbying firm that provides clients with “innovative solutions to their regulatory concern.” Citadel Investments and D.E. Shaw, two large hedge funds that invest in derivatives, are among those paying Newsome and his partner retainers of $120,000 and $160,000 a year, respectively. Jon Corzine’s old firm, MF Global, was good for another $110,000 in the two years leading up to its spectacular implosion in 2011. Gensler pointed to another two recent commissioners. One resigned partway through a five-year term to join Patton Boggs and now runs his own lobbying shop; the other also took a job with the industry before he had finished his term. Gensler stepped back from the wall and counted: fully three-quarters of those who had served as CFTC commissioners over the past decade are among the noisy crowd of lobbyists beseeching him every day to soften the proposed derivatives rules, delay their implementation or simply chuck them out altogether. The industry’s influence extends to the CFTC’s current commissioners as well. As chair of the CFTC, Gensler runs the day-to-day operations of the agency. But he’s still only one vote on a five-person commission that must decide on policy issues ranging from the small (within how many seconds does a registered derivatives dealer need to post the price a customer paid?) to the large (does Dodd-Frank require the CFTC to establish position limits, or can its commissioners choose to do nothing?). The commission is made up of three members from the president’s party and two from the opposition. One of the commission’s current Republican appointees worked as a staffer for one of financial reform’s most outspoken foes, Senator Mitch McConnell; the other previously served as a lobbyist for a swaps and derivatives trade association. Gensler could count on the vote of Bart “Quadrakill” Chilton, who once ripped into Goldman Sachs and Citigroup for duping their own customers, asking, “Did these guys go to school at Screw U?” But the commission’s third Democrat during the critical first fifteen months after Dodd-Frank passed was Michael Dunn, a regulator so industry-friendly that he would resign his seat in October 2011 and join the legions at Patton Boggs working to thwart Gensler’s efforts. So how does the quadrakill begin? With Congress, says Bart Chilton. For example, a lobbyist for one of the big trade groups will complain to a friendly ally in the House that the CFTC is moving too fast or ignoring its warnings. So then the treasury secretary receives a formal complaint signed by this or that House committee chair imploring him to intervene before Gensler inadvertently finalizes a rule that sends half the derivatives jobs overseas. Dodd-Frank expanded Gensler’s mandate exponentially: his agency is slated to go from monitoring $40 trillion in transactions each year to something closer to $300 trillion. And the very first bill Republicans introduced after taking over the House in the 2010 midterms—HR 1—was a measure that would have cut the CFTC’s funding by one-third. “Anything we can do to slow down, deter or impede their ability to engage in this oppressive overregulation,” Senator McConnell explained in 2011, “would be good for our country.” Congress has summoned Gensler to testify on Capitol Hill fifty-one times over the past four years—more than a visit per month since his February 2009 confirmation hearing. Wall Street’s primary beachhead for fighting Dodd-Frank has been the House Committee on Financial Services, chaired until recently by the Wall Street–friendly Spencer Bachus. “Regulators are there to serve the banks”: that’s what Bachus, an Alabama Republican, said shortly after it was announced that he would replace Barney Frank as the committee’s new chair at the start of 2011. The Republicans have introduced dozens of Dodd-Frank-related bills, and almost all of them had been given a hearing in a Financial Services subcommittee. “Fundraising bills,” Mierzwinski calls them—legislation proposed, in his view, mainly to entice the industry to keep writing campaign checks to committee members. The bills that have consumer advocates feeling especially nervous are those being presented as benign changes to an overly complex law. They’re sold as technical fixes, Dennis Kelleher says, “but what they’re really about is creating loopholes big enough for the industry to drive a Mack truck through.” Financial Services and its various subcommittees held more than sixty-five hearings investigating various elements of Dodd-Frank in just the first two years after Republicans took control of the House. You do for the industry, and the industry does for you. In 2012, Bachus fended off a primary challenge from his right and then faced his first Democratic challenger in more than a decade. The $2.7 million in campaign contributions he raised—more than ten times the combined take of his three opponents—allowed him to win easily. And more than a third of Bachus’s contributions came from the so-called FIRE industries (finance, insurance and real estate), which fall under his committee’s purview. The money also poured into Bachus’s political action committee, Growth and Prosperity—$2.5 million since 2007, according to OpenSecrets.org—which he, in turn, funneled back into the party and to his colleagues in the House. Yet the House leadership would replace Bachus after one term with Jeb Hensarling, a Texas Republican so hardline that he’s decided to ban the CFPB’s Richard Cordray from testifying before the committee because he questions the president’s right to have named him in the first place. The financial industry started huddling in meetings even before Dodd-Frank was signed into law. So, too, did Gensler, who was determined to prepare his agency for the assault he knew was coming. Well before Congress had finalized Dodd-Frank, he and his top people created thirty working groups inside the CFTC, each focused on a different aspect of the bill. Gensler, the Goldman Sachs alum, would take an investment banker’s approach, making each team leader responsible for a missed deadline or botched report. The day before the Dodd-Frank signing ceremony, Gensler gathered his team leaders and told them they’d have just ten days to submit a memo laying out the key challenges they faced in implementing their piece of the puzzle. They’d have until the end of August—five weeks—to rework that plan after receiving feedback. Congress had given them twelve months to finalize sixty rules, and even if that deadline was absurdly ambitious, Gensler wouldn’t let anyone say he hadn’t tried. Gensler recognized that his open-door policy would favor industry. While Lisa Donner and Ed Mierzwinski and the Consumer Federation’s Barbara Roper were as free to walk through that same open door as the industry representatives, they were all pretty much armies of one. Indeed, a single private equity firm, BlackRock Inc., logged more meetings with the CFTC in those crucial first five months after Dodd-Frank’s passage than the top four consumer advocates, unions and investor protection groups combined. To date, the CFTC has held more than 2,000 meetings inside the agency, almost all with the industry and its highly paid representatives. The CFTC started publishing draft rules nine months after Dodd-Frank’s passage, offering another chance for the industry to muck up the works. This was the “comments letter” part of the process. Again, consumer advocates and union representatives were free to share their views on whatever the CFTC was proposing, but their lack of resources and boots on the ground meant picking their battles carefully. The big banks, hedge funds and financial trade associations, by contrast, would simply pay a law firm up to $100,000 to research and comment on each proposed rule in letters that ran as long as 300 pages. Savvy financial players know that the 1946 Administrative Procedures Act requires federal agencies to catalog the issues raised and spell out why they are accepting or rejecting each point. The more pages submitted to the CFTC, the more time it would take to methodically sift through every letter. To date, the CFTC has received more than 39,000 reaction letters from the industry, comprising roughly 1 million pages of commentary. And when Wall Street doesn’t win—when, despite everything, an agency writes a rule the industry doesn’t like—there’s always its secret weapon: Eugene Scalia. A partner at the powerhouse DC law firm Gibson, Dunn & Crutcher and the top lawyer in the Labor Department under George W. Bush, Scalia is a thin-faced version of his old man: he has the same dark eyes and heavy brows, the same perpetual five o’clock shadow. Is he as smart as his dad? I ask a congressional staffer whose boss was a key architect of Dodd-Frank. “Probably smarter,” the staffer responds. Scalia filed his first Dodd-Frank-related suit in September 2010—two months after the signing ceremony. The lawsuit focused on a seemingly trivial matter: a new SEC rule requiring publicly traded companies to pick up the costs of sending out voting materials not just for their own slate of candidates for the board of directors, but for anyone nominated by at least 3 percent of the shareholders. The change seemed one explicitly dictated by law, but Scalia argued that the SEC’s rule was “arbitrary and capricious” and favored special interest investors like state and union pension funds. The DC Court of Appeals, a notoriously conservative body, ruled against the SEC, which chose not to appeal. The ruling stirred up profound anxieties within the CFTC. It wasn’t the ruling itself, says Andrei Kirilenko, the agency’s chief economist, so much as the court’s rationale. The court, following Scalia’s technocratic argument, found that the SEC had considered some, but not all, studies in its cost-benefit analysis. The judges revealed that they were troubled by the SEC’s out-of-hand dismissal of one study in particular—a study funded, it turned out, by the Business Roundtable, which was one of the two trade associations funding Scalia’s suit. The ruling hit like a punch to the gut. “The SEC had been working pretty systematically through the rules, but then, when they lost that lawsuit, everything just ground to a halt,” says the Consumer Federation’s Barbara Roper. The SEC claimed to have devoted 21,000 staff hours to writing this one simple directive. It still had another ninety-plus rules to go. And with this precedent, every new rule—whether issued by the SEC, the CFTC, the Federal Reserve or any other agency—would require a massive cost-benefit analysis. Whereas the typical CFTC directive might have included several paragraphs of cost-benefit analysis in the past, says Kirilenko, who left the agency at the end of last year for a teaching post at MIT, eighty pages would now be the norm. Yet even that wouldn’t be enough. The cost-benefit argument would be central to all seven of the Dodd-Frank-related suits that Scalia has filed so far. Four of those were filed against the CFTC, including a successful challenge that has resulted, at the moment, in the “position limits” aspect of Dodd-Frank being left up in the air. “An absolute bulldog,” Jim Collura says when asked to describe Scalia’s style in oral arguments over the CFTC’s position-limits rule. “I thought he was going to karate-chop the podium in half.” The CFTC has appealed the ruling. Think of Annette Nazareth as the Democratic version of Scalia, doing what she can to slow down Dodd-Frank’s implementation by other means. Where Scalia barks at his adversaries, Nazareth shares “lingering concerns.” She cajoles rather than criticizes. Her résumé includes stints with Lehman Brothers and Citigroup and almost a decade with the SEC before moving to Davis, Polk & Wardwell, which counts every major bank as a client. She would be late for our appointment because of a last-minute gathering in Gensler’s office. There, she and others were hoping to convince him to delay the implementation of a set of rules taking effect that week that would require the biggest banks and others to start registering as swap dealers. But Gensler wouldn’t budge. “You can’t win them all,” she says with a tight smile. Nazareth’s offices look more or less like Scalia’s, which is to say they stand in stark contrast to the Office Depot clearance-sale look of their adversaries. Nazareth works on the top floor of a twelve-story tower four blocks from the White House. White orchids decorate the blond-wood conference room where we meet, and there is a carafe of fresh-brewed coffee to enjoy as we sink into the rich leather chairs. What about those who say she’s working to hollow out Dodd-Frank? I ask. “That’s such a simplistic view,” she answers. Sure, the CFTC, SEC and other agencies are struggling to implement the law. But that’s because of the immense complexity of the task, not the power of lobbyists and lawyers like herself. As she sees it, she’s a kind of pro bono adviser to public servants. “A huge amount of our time is spent helping regulators understand how to achieve their goal in a more effective way,” she says. Of course that’s how she’ll frame it, counters Dennis Kelleher of Better Markets. “Wall Street can’t say, ‘We’re against Volcker because it’s going to kill our profits and mean smaller bonuses.’ So instead it’s ‘Volcker is going to kill the corporate bond market,’ or ‘Volcker is going to wreck the economy.’” The true genius of Annette Nazareth and advocates like her, he adds, is their ability to make it sound like they’re helping—all the while turning a simple new rule into one that stretches for 200 pages, creating more carve-outs and exceptions. And then there’s the fight over what insiders call the “de minimis exception,” which found Kelleher crossing swords with Nazareth and some of her biggest clients. The question confronting the CFTC—as well as the SEC, which is responsible for a small sliver of the derivatives market—was this: Who would need to register as a dealer in order to sell derivatives in the new open markets that Dodd-Frank was enabling? The original proposal on the table was for a “de minimis” exception of $100 million: only if your annual derivatives revenue topped $100 million would you have to go through the expense and bother of registering and then complying with a strict regulation regimen. But then came all those reasonable arguments from the likes of Nazareth, and the exemption was inflated to the point of absurdity: a threshold of $8 billion, which would shrink to $3 billion after three years, prompting Kelleher to call it the “de maximis” exception. Although the CFTC is further along in its work than the other agencies, that only underscores how much work remains to be done on Dodd-Frank nearly three years after its passage. The CFTC has finalized forty of its sixty rules, according to the Dodd-Frank Progress Report, which Nazareth’s firm publishes each month. That leaves a lot of rules that still need to be finalized before there’s a workable derivatives market. Still, compared with the other agencies, the CFTC has proved to be a speed demon. The SEC has barely finalized one-third of its rules, and the various bank regulators (the Fed, the FDIC and the Office of the Comptroller of the Currency) are faring even worse. As a group, they’ve failed to publish draft language for one-third of their portfolio of assignments and have finalized only 27 percent of its rules. So while a new Volcker Rule might not have prevented an embarrassment like JPMorgan’s “London Whale,” the bank probably wouldn’t have lost $6 billion on the deal, and the regulators could have potentially seen what was happening sooner. Since January, banks and others have been filing the requisite paperwork to establish themselves as registered swaps dealers. But there won’t be a market in which to do business until the CFTC’s five-person commission finalizes the relevant rules. There are also big policy issues to be worked out, not the least of which relates to how the CFTC treats the foreign subsidiaries of US-based banks. Can Citigroup simply run some of its derivatives book out of the Cayman Islands, as it was doing in 2008, thereby avoiding Dodd-Frank by shifting its derivatives business offshore? The answer right now is yes, it can—and that’s what the answer will be until the CFTC definitively says otherwise. Our blogger Greg Kaufmann writes that bank accountability activists continue to send a clear message to the big banks: “You can run, but you can’t hide.” And one of our Nation Builders has posted an excerpt from Neil Barofsky’s Bailout: An Inside Account of How Washington Abandoned Main Street While Rescuing Wall Street addressing the serious limitations of Dodd-Frank bill. Gary RivlinGary Rivlin is an Investigative Fund reporting fellow at The Nation Institute. His latest book is Katrina: After the Flood (Simon & Schuster).